Here’s my first report on experiences with Windows 8 Pro RTM, in the wake of two successful upgrade installs: one on my Lenovo X220 Tablet, the other on my i7-2700K. First things first: Mr. Denny’s tip on modifying the cversion.ini file in the .../sources directory in the unpacked ISO files is a gem. I was indeed able to use a modified ISO-based image for Windows 8 Pro to perform an upgrade install on my Windows 8 Release Preview install, and preserve my already-installed applications and tools, as well as settings and preferences while installing the latest and final version of the OS on my Lenovo X220 Tablet and my i7-2600K desktop PC. As you might expect, the installation takes a while longer (over half an hour) when you have various installed elements to port over from an old OS to a new one. I grabbed the Windows 8 Pro ISO from MSDN on Tuesday, and then used the Windows 7 USB DVD Download tool to convert that ISO to a writable install image on an 8 GB UFD (I tried a 4 GB UFD, and the copy process failed to complete properly, so you’ll want to go 8GB or larger). A quick edit to the aforementioned file, and everything worked as I expected it to. The post-install aftermath came with a couple of unexpected and interesting side effects. I figured the Windows 8 RP drivers would port to Windows 8 RTM without a hiccup, but I figured wrong. For one thing, I had issues across the board with Bluetooth. Before the installer would let me proceed with the Windows 8 Pro install on my desktop, which includes an Asus P8Z68-V Pro Gen3 motherboard with built-in Qualcom Atheros BT circuitry, it required me to uninstall the Asus BT GO! 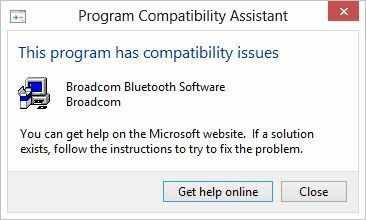 Bluetooth software, citing incompatibility issues with that software. And so far, I’ve been unable to find a replacement BT software suite to run with this motherboard, either. That said, the built-in Windows Bluetooth utilities — namely Add Bluetooth Device, Change Bluetooth Settings, View Devices and Printers, and Set up a connection or network — all work properly with the default driver that Windows 8 Pro RTM installed on that machine. Likewise, I’ve been unable to install and use what DriverAgent insists is the latest and greatest Bluetooth driver on either machine, so there’s something wonky going on with BT that I’m still puzzling my way through. Intel HD Graphics 3000: I was able to grab and use a Fujitsu driver (they seem to be doing a very good job of keeping up with Windows 8 drivers, and I’ve learned to trust them as a source for solid, stable Windows 8 driver software). 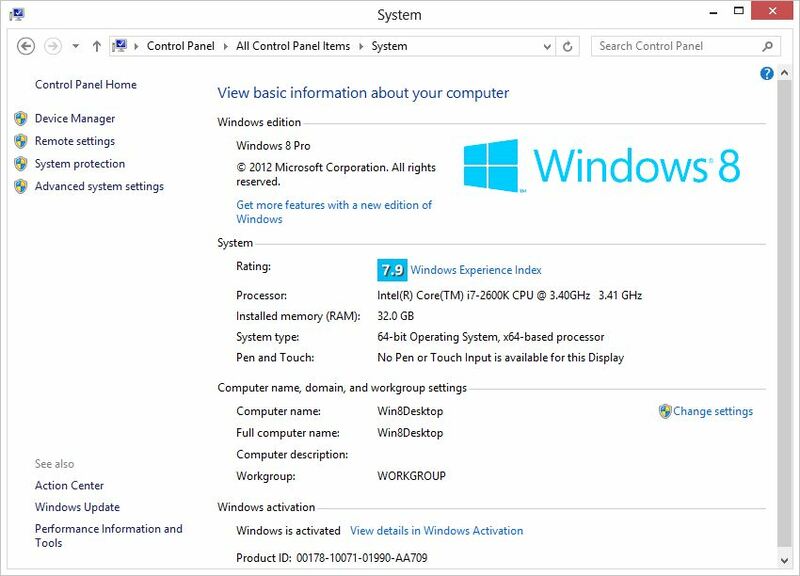 But my Windows Experience Index value for this graphics circuitry dropped from 5.1 in Windows 8 RP to 4.6 in Windows 8 Pro RTM. Intel 82579LM GbE Network Connection: another Fujitsu driver to the rescue here, thanks very much. Intel Display Driver Audio: still one more Fujitsu driver, and thanks again. I imagine I’m just going to have to wait to get these matters resolved, as Asus and Lenovo (and probably also, the Bluetooth technology vendors such as Qualcom Atheros, Broadcom, and so forth) get their heads around the underlying issues and start to issue newer drivers and software tools for their Bluetooth devices. Desktop Gadgets are indeed gone, gone, gone (searching for “Gadget” through the Start screen turns up 0 Apps, 0 Settings, and 0 related Files). Gabe Topala’s Siw-x64.exe (the temporary version he produced for Windows 8 beta users) quits working in the RTM version. So far, no news on a replacement 64-bit commercial version for Windows 8 x64 RTM and final versions, either. All of my applications still appear to be working: I haven’t made an exhaustive survey of everything yet, but every program I’ve tried has continued to work without issues (except for the Bluetooth stuff the installer asked me to uninstall before I continued on with Windows 8 Pro installation, but since it’s not installed anymore, I can’t exactly try it out — and it won’t install on Windows 8 Pro, either). My final comment on where things stand is “So far, so good.” I’ll continue to follow up as more things present that appear worthy of reporting and discussion.